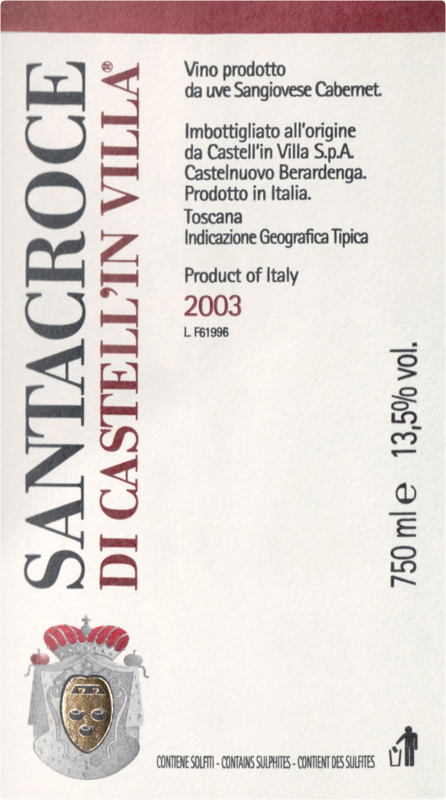 "The 2003 Santacroce is another beautiful wine from a harvest that was extremely challenging because of the torrid heat. Dark red cherries, tobacco, licorice and incense are some of the notes that flow from this rich, textured wine. Firm yet polished tannins give the 2003 much of its energy and sense of vibrancy. Anticipated maturity: 2012-2020. Castell-in Villa is one of the most historic estates in Chianti Classico. Princess Coralia Pignatelli della Leonessa and her husband found the property in 1967 and purchased it the following year. Initially, Princess Coralia and her husband thought they would make wine for fun. Princess Coralia's father, a Greek aristocrat, demurred at the thought of his daughter becoming a peasant. At the time, there was just one hectare under vine, but planting began in earnest in 1968 following the suggestions of the Chianti Classico Consorzio, which included white grapes that ended up being used for the first vintages. This tasting covered a number of vintages of the flagship Chianti Classico Riserva going back to the inaugural 1971. I also tasted several vintages of the single-vineyard Chianti Classico Poggio delle Rose and Santa Croce, the estate's Sangiovese/Cabernet blend. I have included those notes here for reference. Castell-in Villa's Chianti Classico Riserva is fermented in stainless steel, where it also undergoes malolactic fermentation. The wine is then racked into cask where it spends about three years prior to being bottled. It remains one of the most rigorously traditional Chianti Classicos. Poggio delle Rose was planted in 1990 with a clonal selection taken from Castell-in Villa's original vineyards. The wine is aged exclusively in French oak barrels. A small amount was produced in 1994, but the first commercial release was the 1996. The estate's Santacroce is a Sangiovese/Cabernet Sauvignon blend aged in French oak first produced in 1983. Although originally conceived as a pure French oak-aged Sangiovese meant to compete with the trendy wines of the day, Princess Coralia began using Cabernet Sauvignon in the blend beginning in 1988. The Cabernet was grafted onto existing Canaiolo at the suggestion of famed oenologist Giacomo Tachis in the late 1970s. Princess Coralia met Tachis in 1977, the same year her father passed away. Tachis bought wines in bulk at Castell-in Villa for the early vintages of Antinori's Tignanello. Although Tachis was never formally a consultant to Castell-in Villa, he advised Princess Coralia on a number of matters, including suggesting she uproot her Canaiolo and Colorino in favor of Sangiovese and later Cabernet Sauvignon. My favorite wines in this tasting were the wines from the 1990s Riservas. Those vintages are old enough to offer plenty of complexity, but still have enough fruit. The wines I tasted from the 2000s were more approachable in style. Princess Coralia says she is paying more attention to details in the cellar. I am sure that is true, but I can't say there is anything from the wines of the 1990s that required too much tinkering." "A red that requires faith, this starts out with concentrated sweet fruit and ends with burly tannins. The proportions seem balanced, with black cherry, blackberry, spice and mineral flavors. Long, but rustic in character. Sangiovese and Cabernet Sauvignon. Best from 2014 through 2024." 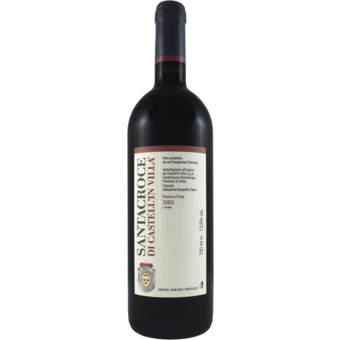 "The Santacroce is Castell’in Villa’s flagship wine made from 50% Cabernet Sauvignon grapes and 50% Sangiovese grapes. The wine is then stored for 18 months in barriques, traditional Bordeaux oak barrels of 225 litres capacity. The Santacroce is an example of what is called a Super-Tuscan wine. It is the result of the mix of the best methods and ingredients in local wine making and the creativity of the wine maker. Since the wine making method does not comply with the local rules for the D.O.C.G., the wine is only allowed to be classified as IGT Toscana.